OKI MC562dn colour laser multifunction printer is an ideal solution for a busy workgroup with print, copy, scan and fax features, with outstanding speed and superior text quality. The OKI MC562dn printer weighs approx. 29 kg and it uses the innovative and energy-saving digital LED-print technology. The device has a large control panel at the front end with light-grey buttons on a dark-grey background. The control panel of the printer offers many function button for tasks like navigation, cancel, scan, copy, fax, dial etc.. This neatly designed control panel makes it easy to operate and the addition of LCD display enhances the user experience. On the right hand side of the panel there is a QWERTY keyboard which is handy for entering long email addresses. The MC562dn has two paper trays. The main tray can handle up to 250 sheets and the one in the front that you can load manually has space for 100 sheets. The ADF on this printer can store up to 50 sheets of paper at a time. The device has 256MB RAM and a 536 MHz processor. It also has a memory card slot capable of handling up to 16GB of memory. The device runs with the print speed up to 30 ppm having a resolution of 1,200 dpi. The OKI MC562dn has various special features offering super G3 compatible 336.6 kbps fax machine, efficient document management functions, advanced network security configurations and image enhancement tool. 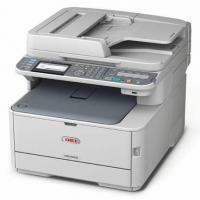 The OKI MC562dn colour multifunction printer produces excellent outputs with fast print speeds. The printer best suits for office or small group units as it has many advanced features and growing functionalities. However, the high capacity OKI MC562dn toner cartridges are quite expensive and increases the running cost of the printer. This multifunction printer also has attractive looks with rounded corners on all the sides and a control panel which is clearly and neatly placed, offering ease of use to the users. How to overcome the problem of faded prints in OKI MC562dn printer? Open the top cover of the printer and try tapping the cartridge a few times to evenly distribute the toner powder. This will enable you to obtain the best yield from your OKI MC562dn toner cartridges. To avoid the toner wastage and possible toner sensor errors, do not replace your toner cartridge(s) until “TONER EMPTY” is displayed. The toner used in printer is a very fine dry powder. It contains four possible cartridges: one each for cyan, magenta, yellow and black. Note the positions of the cartridges and make sure that they go back in the relevant slots. Keep a sheet of paper with you to place the old cartridges on, while you install the new one. This will prevent your toner from marking your furniture. Clean the top of the ID unit with a clean lint free cloth. If you do spill any toner powder, then lightly brush it off. If that is not enough then you may use a cool or damp cloth to remove residue but avoid using hot water, as they will make stains permanent. Remove the new cartridges from the box but leave its wrapping material at its place for the moment. Gently shake the new cartridge to loosen it and distribute the toner evenly inside the cartridge. After that remove the wrapping material and use it to dispose the old cartridges. Hold the cartridge by its top centre, lower it into the printer over the drum unit from which the old cartridge was removed. Insert the left end of the cartridge into the top of the drum unit, then push it against the spring, after that lower the right end of the cartridge down onto the drum unit. Pressing gently down on the cartridge to ensure that it is securely seated, slide the coloured collar fully towards the left-hand side of the printer. This will lock the OKI MC562dn toner cartridges into place and then release toner into the drum unit. Gently wipe the LED head surface with a clean, lint-free cloth. And then finally, close the top cover and press down firmly at both sides so that the cover latches closed. Q. I bought compatible OKI MC562dn toner cartridges which I will be using for the first time. Since OKI is a new brand for me, I’m now wondering its compatible version will keep my printer intact like other brands like HP, Brother, etc. and not cause a problem. A. Please rest assured that OKI’s compatible toner cartridges are in every way as good as those of major brands. These compatible cartridges will not cause any problem to your printer as they’re the same design and size as the original ones. these cartridges are rigorously factory tested to the same ISO standard as the original brand toner cartridges. Q. I have an extra multipack of OKI MC562dn toner cartridges. If I use them in OKI MC561 printer, is there a risk to the printer even though they are compatible? A. No, your printer will not face any kind of problem as the manufacturers have affirmed officially that they’re compatible and suited to each other. You can use toner cartridges of one printer with other models also. Q. I’ve been getting faded printouts of late whenever I print. I’ve been using OKI MC562dn toner cartridges in my printer. Can you tell me what’s the reason and what I need to do? Thanks. A. It looks like that LED heads of your printer are unclean. Please wipe the windows of all the LED heads with a soft, dry lint-free cloth or a soft paper napkin. Take a test printout to see if doing that has helped. Q. Is OKI MC562dn printer good as a multifunctional printer if paired with compatible cartridges? A. Yes, the OKI MC562dn printer can scan, fax and copy besides printing very efficiently with compatible toner cartridges as well; in fact, you will be saving more money and yet get the same best quality result if you use compatibles with it. Q. How many pages will OKI MC562dn toner cartridges can print? A. The ink used in printing a text document is much lower than printing a photo. Ink consumption depends on what is being printed. The toner cartridges supplied on the site produce at least as many pages, as those can you get from the original suppliers. Ink cartridges come in a different pack, which have different capacity to print pages. We have a range of 4 multi packs available for OKI MC562dn printer, each cartridge can print around 5000 pages. Q. I want to return the cartridges as I got the wrong cartridges for my printer. How can I return them? A. If you got the wrong product, need not worry. You can easily return an item within 7 days from the date you received the order. There are few things that you need to follow while returning the item that is, if you are returning a faulty item or exchanging an item, return it to the address on the packing slip or invoice. You must return the item by post or courier within the given time period for fast response. Once we receive the product will place a refund in your account or you can place the order for the new OKI MC562dn toner cartridges that works for your printer. Q. I've tried shaking the cartridge but it doesn't help. How can resolve low ink problem? A. If shaking the toner doesn't help it means the cartridges need replacement on urgent basis. It might be possible that the drum in the cartridge has dried up or the OKI MC562dn Toner Cartridges you’re using are low on ink. A. OKI MC562dn prints with the speed of 30ppm and with the resolution of 1200dpi. Q. I was using a network connection and suddenly, not able to print. I don’t know what happened to my printer? A. If you set to obtain the printer or multifunctional product IP address automatically, the IP address assigned to the product may change depending upon the timing at which the device is turned on or off. If the device's IP address got changed, it won’t be able to communicate with the connected PC for print. Consider the following solutions. Q. I have heard that using the recycled or compatible OKI MC562dn toner cartridges will void the printer warranty but I am not sure. Do you have any info regarding this? A. The OKI cannot gave the printer warranty just because of the remanufactured or compatible cartridge used in it. They have to prove that the defect occurred is because of the compatible cartridge. So, you just need to make sure that your recycled or compatible cartridge is of high quality and well-tested. Our all compatible OKI MC562dn toner cartridges are fully tested and are expected to perform as good as the original ones. Q. How to print using the AirPrint? A. The applications that are AirPrint-enabled can print to the device. You do not need to install a driver for it. Tap to print, select AirPrint-enabled device, and print. Connect using a network. AirPrint supports wireless connections that use infrastructure mode. Q. Why the usage of high-quality products matters most in printing? A. For the protection of your product, and in order to ensure that you will get benefit from its full functionality, the OKI MC562dn has been designed to operate only with good or high-quality OKI MC562dn toner cartridges. Any other type of low-quality cartridge may not operate well for it, even if it does work, the product's performance and print quality may get degraded early before time.